Winter is coming. It is an inevitable future. Safety covers for Las Vegas swimming pools — are they really worth it? In today’s blog we will compare the Costs vs. Benefits of safety pool covers. Accidental drowning here in the valley is all too common, even in winter months. While drowning is an especially present danger for children it can strike people of all ages and animals (either domestic or wild) as well. To determine if a winter safety pool cover is right for you, please read over the costs and benefits listed below, and contact us with any questions you may have before making your final decision. First and foremost a safety pool cover can make your pool safe, but this isn’t the only benefit to having one. Safety covers keep light and organic debris out of your pool. This is an obvious benefit as you won’t need to be fishing out debris throughout the winter months. You will not only save time cleaning your pool, but you will also save peace of mind when you want to relax in your pool again. Additionally, a pool safety cover will help reduce evaporation, saving this precious resource. 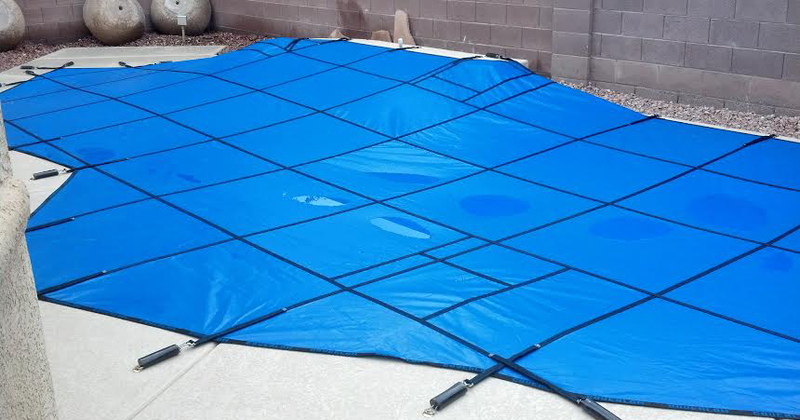 A standard winter cover may need to be replaced as often as every 2 to 3 years due to the harsh conditions we experience in the Las Vegas area. Our winter safety covers are designed to outlast the competition with a 12 year Limited Warranty. The savings from a pool cover adds up in the long run when you combine the cost savings of chemicals, water, time and energy. But the biggest savings our customers experience is piece of mind. Ultimately each home owner must determine what features and benefits matter most and make a decision based on the facts. To learn more, contact Safe Defenses and get a no obligation consultation with a pool safety cover professional today.